Astm B705/751 Incoloy 825 Seamless Pipes Manufacturer, Incoloy 825 Round Pipes, Incoloy 825 Polished Pipes. Reliant Pipes Supplying high quality Incoloy 825® products for your custom nickel alloy needs. Contact us for more information, or request a quote today. Incoloy 825 is a nickel-iron-chromium alloy with additions of molybdenum, copper and titanium. This nickel steel alloy’s chemical composition is designed to provide exceptional resistance to many corrosive environments. It is similar to alloy 800 but has improved resistance to aqueous corrosion. It has excellent resistance to both reducing and oxidizing acids, to stress-corrosion cracking, and to localized attack such as pitting and crevice corrosion. Alloy 825 is especially resistant to sulfuric and phosphoric acids. This nickel steel alloy is used for chemical processing, pollution-control equipment, oil and gas well piping, nuclear fuel reprocessing, acid production, and pickling equipment. Reliant Pipes can supply this alloy as plate, sheet, strip, bar, rod, wire, tube, pipe, fittings, fasteners. Alloy 825 seamless pressure tubing in the heat treated condition is typically used in oil and natural gas wells for applications including hydraulically actuated surface-controlled subsurface safety valves, chemical injection, and instrumentation. In such applications, it is commonly referred to as control line tubing. The tubing is generally deployed by strapping it to the outside of the production casing. It may be encapsulated and can be included along with other pressure or TEC and mechanical components, such as bumpers, within a flatpack. The tubing is frequently supplied as 5,000 to 35,000 ft. coils on a wooden or steel reel, depending on size. Alloy 825 is a titanium-stabilized austenitic nickel - iron - chromium alloy with additions of molybdenum, and copper. The chemical composition of the alloy is listed in Table 1. The alloy is characterized by good resistance to stress-corrosion cracking due to its nickel content (38.0 to 46.0) and satisfactory resistance to pitting and crevice corrosion. Alloy 825 has shown good corrosion resistance in oil and gas production environments containing hydrogen sulfide, carbon dioxide and chlorides. Consult ISO 15156-3, Table A.14 for the limits regarding material type 4c in hydrogen sulfide containing environments for oil and gas production. Draka uses expert system software to assist customers in their selection of alloys for oil and gas environments. Seamless extruded tube hollows are drawn or drawn/sunk to final size to produce seamless tubing coils 500 to 2,000 ft long, depending upon the size. The tubing is heat treated and joined by orbital welding to achieve the desired length. The final material condition of the tubing is heat treated. 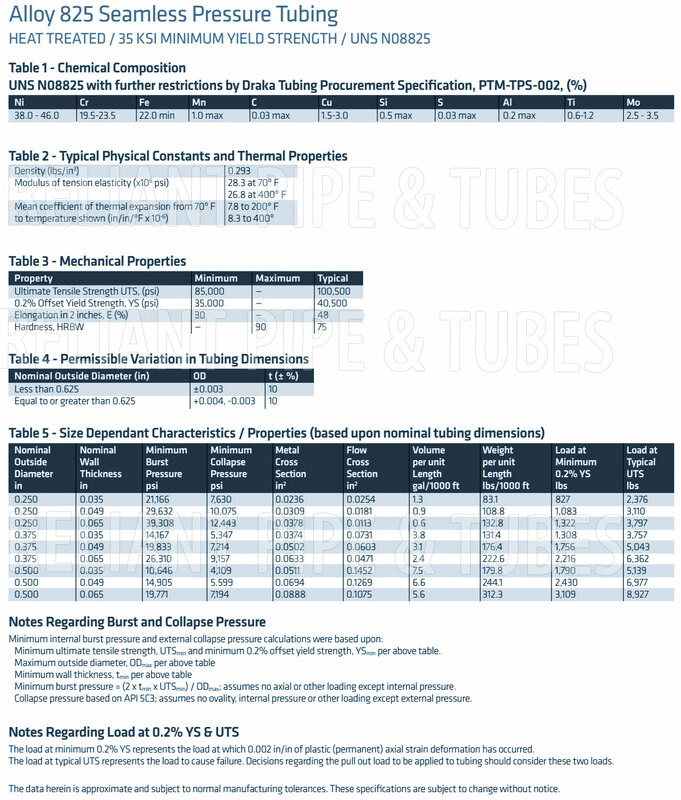 Mechanical properties, permissible variation in tubing dimensions and size dependant characteristics / properties are listed in Tables 3, 4, and 5 on reverse respectively. Eddy current testing (ECT) is performed at final size in the heat treated condition. Radiographic testing is performed on all orbital welds. Yield pressure hydrostatic testing is performed on the heat treated tubing at final size. Price of UNS N08800 Seamless Pipe : $ 23500 ~ $ 25000 USD / Ton. Price of Inconel 800H/800HT Seamless Pipe : $ 33500 ~ $ 35000 USD / Ton. Price of UNS N08810/UNS N08811 Seamless Pipe : $ 33500 ~ $ 35000 USD / Ton. Price of Incoloy 825 Seamless Pipe : $ 25000 ~ $ 26500 USD / Ton.